The supernatural action-thriller Priest will open in Philippine cinemas starting May 11. 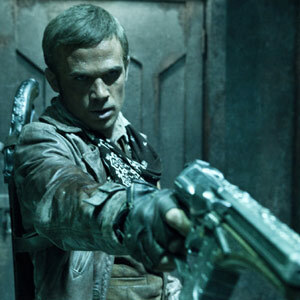 Cam Gigandet (in photo) is cast as a trigger-happy young wasteland sheriff in this Paul Bettany starrer. "They both found fame playing vampires. Now, Cam Gigandet (Twilight) and Stephen Moyer (HBO’s True Blood) are on the opposite side of the fence fighting bloodsuckers in Columbia Pictures’ new supernatural action-thriller Priest. "Based on the popular graphic novel series written by Min-Woo Hyung, Priest is set in an alternate world--one ravaged by centuries of war between man and vampires. The story revolves around a legendary Warrior Priest (Paul Bettany) from the last Vampire War who now lives in obscurity among the other downtrodden human inhabitants in walled-in dystopian cities ruled by the Church. "When his niece, Lucy (Lily Collins), is abducted by a murderous pack of vampires, Priest breaks his sacred vows to venture out on an obsessive quest to find her before they turn her into one of them. He is joined on his crusade by his niece’s boyfriend, Hicks (Gigandet), and a former Warrior Priestess (Maggie Q) who possesses otherworldly fighting skills. Opening across the Philippines on May 11, Priest is distributed by Columbia Pictures, local office of Sony Pictures Releasing International."